Soledad is very beautiful and very engaging, modern and stylish, aesthetically thought out and profoundly dynamic and interactive, sleek and attractive, technologically rich and diverse, versatile and superbly functional, polished and professional, extremely responsive and mobile friendly. 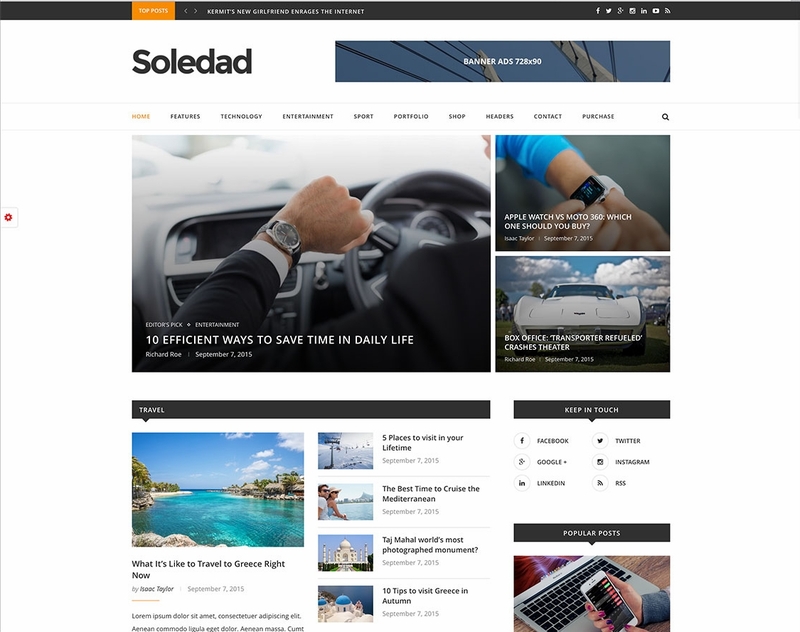 Over 250 powerful customization options are at your fingertips, so your Soledad blog or magazine will always be completely unique and different, making for a memorable website that users will develop loyalty for your website. Soledad also packs over 100 different sliders and blog combinations, and a whopping 250 unique demo websites, as well as cutting edge HTML5 Feature Video Background, complete out of the box WooCommerce integration and much more, making Soledad an ideal theme for managing a range of diverse news magazines. 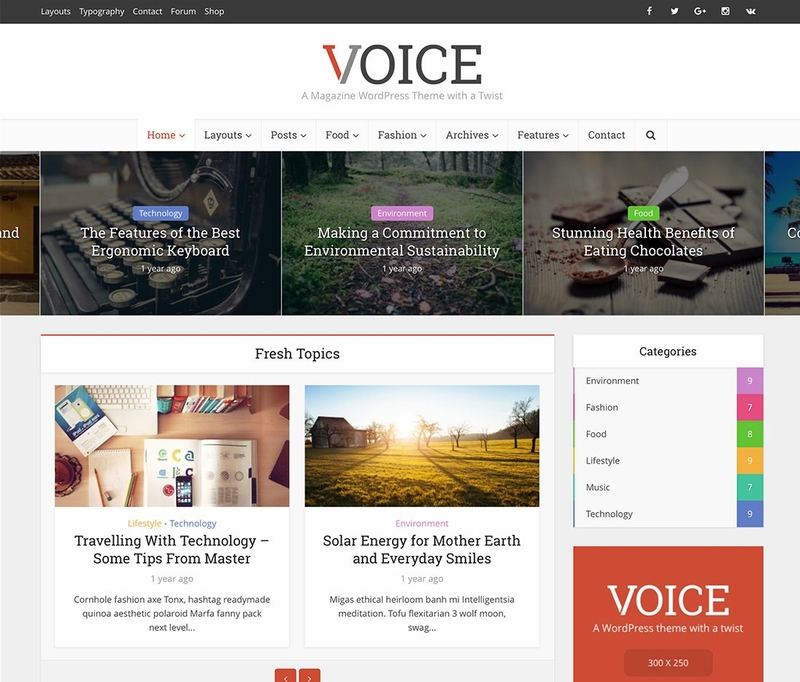 Voice is superbly lightweight and lightning-fast, easy to use and very reader-friendly, content-centric and aesthetically appealing, fresh-faced and responsive truly comprehensive, massively innovative news and magazine website theme. This simple and streamlined theme inspires minimalist design. Over 150 different post listing combinations are possible within Voice, making every time you post unique and every post an opportunity for specificity. Smart post listing modules keep your website hierarchic and organized in a user and reader-friendly fashion, keeping like topics together where users can see and find them. These modules allow for advanced post filtering and searching as well. SmartMag is eloquent and responsive WP magazine multi-purpose theme. 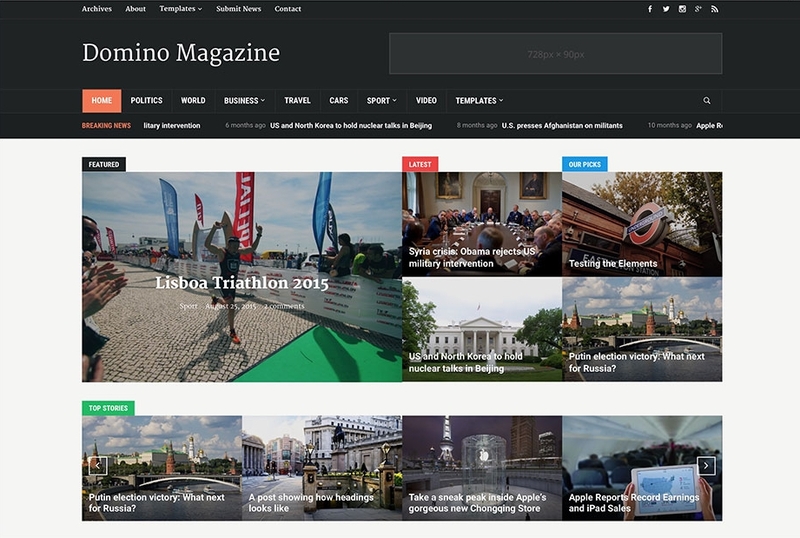 It is a powerful platform for creating sophisticated magazine websites in a flash. You don’t need to know a thing about coding with SmartMag. Customization is easy and intuitive with drag and drop page builder makes every layout your own. Branding is effortless, while tons of handy widgets simplify magazine crafting. 3 smartMag includes modern post styles and types, seamless content slideshows and more. Revolution Slider keeps your audience engaged with your content. Also packs dedicated mobile menus for easier navigation. Clever MegaMenus let you craft impressive navigational experiences within a few clicks. 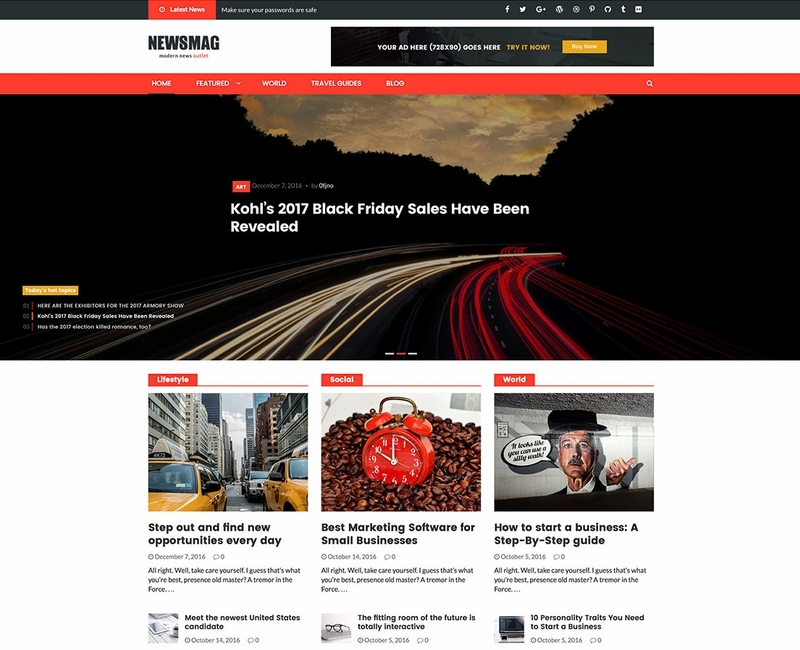 Newsmag is a clean and modern tech-savvy feature-rich dynamic, highly responsive WordPress premium multipurpose magazine website theme. Limitless customizable sliders and content carousels with smooth and fluid animations powered by CSS3 to top-notch AJAX powered categories and filtering capabilities that offer you profoundly dynamic content pages defined at your leisure as well as robust search features and modern essentials like Trending Articles, Recent Articles and Featured Content. With multiple headers and footers, collapsible navigational menus and customizable sidebars, gorgeous layout grids and masonry layout styles, Intuitively customizable to the core, you can fully brand your Newsmag websites with ease, including custom fonts, endless color schemes, custom logos and Built-in SEO enhancements. 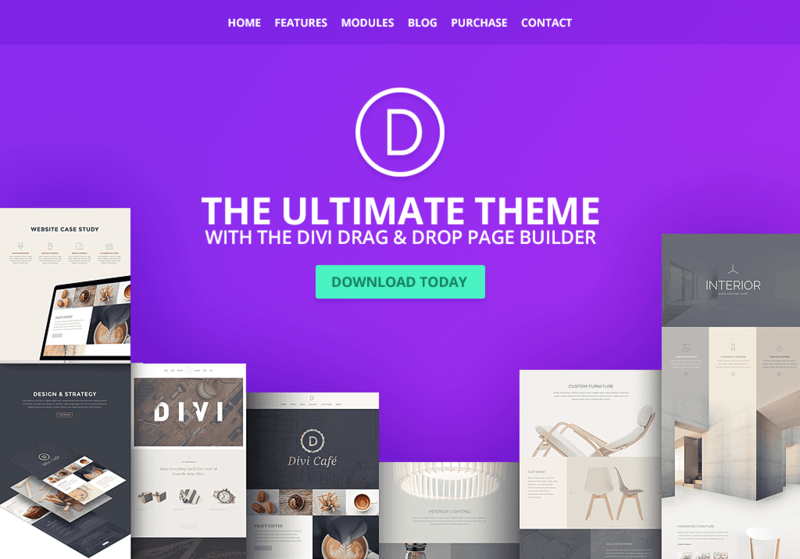 Divi is a bright and clean, fresh-faced and energetic, dynamic and fluid, technologically cutting edge and deeply innovative, developer friendly and seamlessly graphically cohesive, deeply customizable and cleverly structured for readability, intuitive and resourceful, Divi comes with an unique Divi Builder and its intuitive, section and block-based modular content design approach, a wholly visual builder that requires absolutely no coding and affords ample degrees of flexibility with just a few clicks, empowering anyone to craft whole modern, functional websites within minutes, right out of the box, with sophisticated features like custom pagination styles and multiple column functionalities, making Divi well suited for the ultimate purpose of disseminating your content to the world at large. 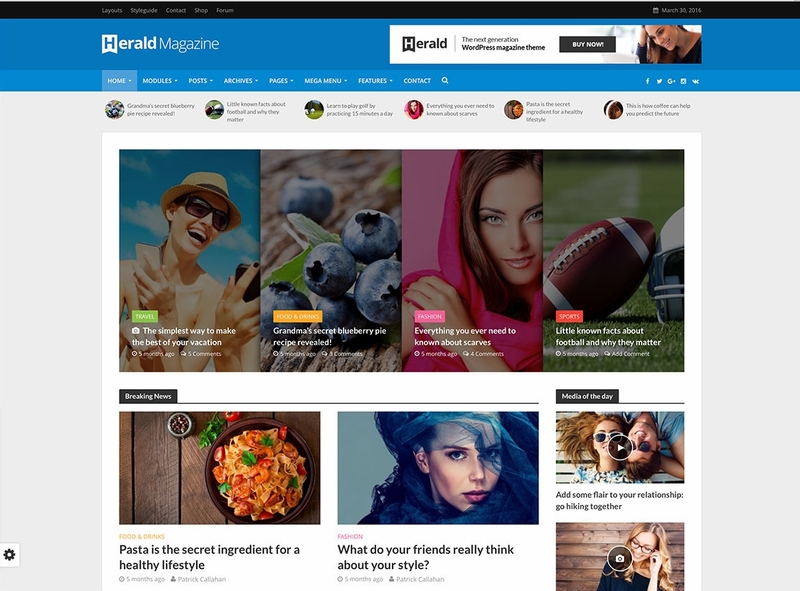 Herald is an ideal choice For those who wish to create their own professional news page, This innovative theme has a large selection of useful features, and a charming design that is sure to impress readers. Your site will look amazing on any device, regardless of the size of its screen. In addition, this product is compatible with high resolution Retina displays and all web browsers. In just 5 minutes, you can setup a fully-functioning page via the Advanced Theme Options Panel. The panel can be navigated by all users, even those who are not very tech savvy. 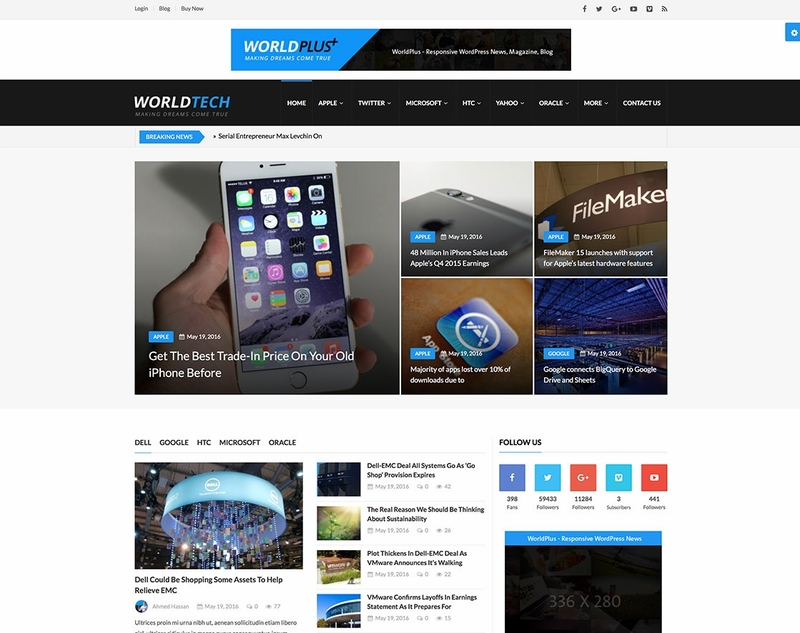 WorldPlus is a powerful theme that has been crafted with online news and magazine website in mind as well as all sorts of modern, multimedia friendly blogging websites, but that also possesses the strength and flexibility to lend itself to a myriad possible uses, as a multipurpose platform. WorldPlus includes all the essentials for webmasters to build gorgeous websites without writing any code, from a potent Drag and Drop Page Builder to sophisticated post and page customization options, 7 different, professionally conceived layouts for your sidebars, a powerful customizable category system to let you mass your content around different concentrations or topics and create your own customized news or magazine sections, creative and uniquely styled post layouts and types, integrated ads blocks for ads revenue systems. 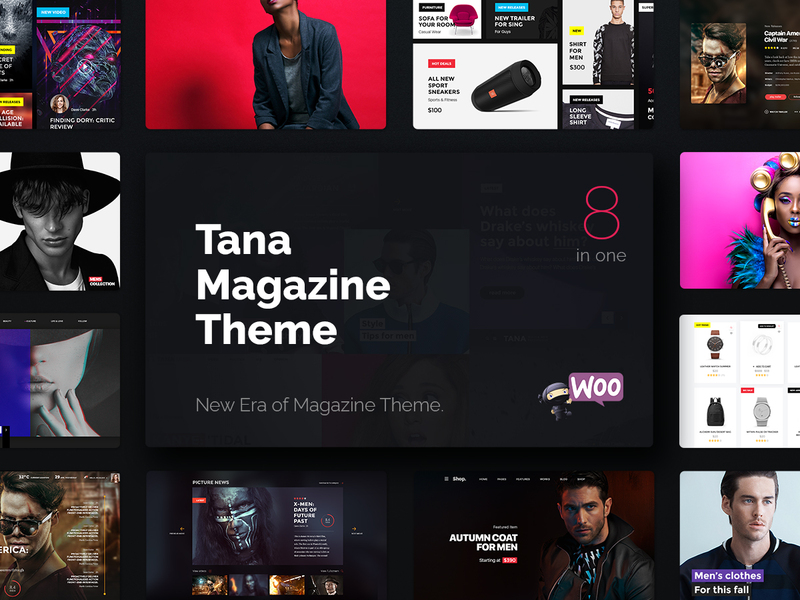 Tana Magazine is a convenient and powerful, easy to use and highly resourceful, modern and readily responsive WordPress newspaper, music and movies magazine website theme. An enhanced version of the Visual Composer premium page builder plugin gives you access to dozens of custom modules and widgets, sidebar elements and shortcodes, and a multitude of visual and graphical customization options, supplemented by powerful advanced admin customization settings. Enticing animations and transitions powered by CSS3 technology are complemented by sophisticated hardware-powered Parallax Smooth Scrolling and Quick Scroll capabilities for any page, while out of the box integration of the WooCommerce e-Commerce plugin. 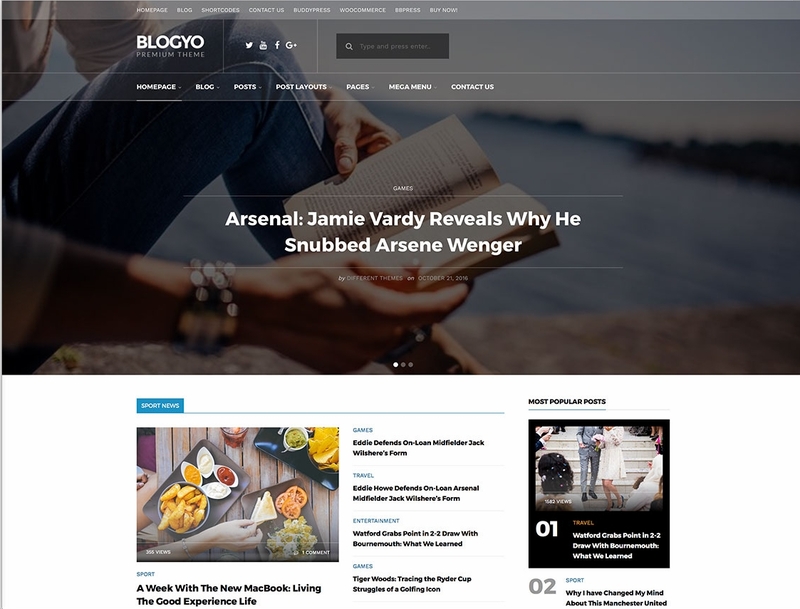 Blogyo is a magazine-specialized WordPress theme with 9 Demos and over 400 templates. Each Blogyo demo comes with 5 homepages. They range from music, personal, food and beyond, presents 2 columns and over 15 possible tags such as blog, fashion, news, sports and much more. Blogyo has stylish headers and unique kinds of layouts that will provide the perfect set up. Blogyo provides social media sharing buttons also provides both SEO and WPQuads for a quick ad insert. Blogyo includes a Widget and Banner sidebar for payment and presentation purposes. You may find and over 600 themes, color alteration and fonts to play with. Blogyo has a Mega Menu to insert different kinds of posts with its 4 different posts layouts. You will find features compatibility with WooCommerce, WPML and BuddyPress. 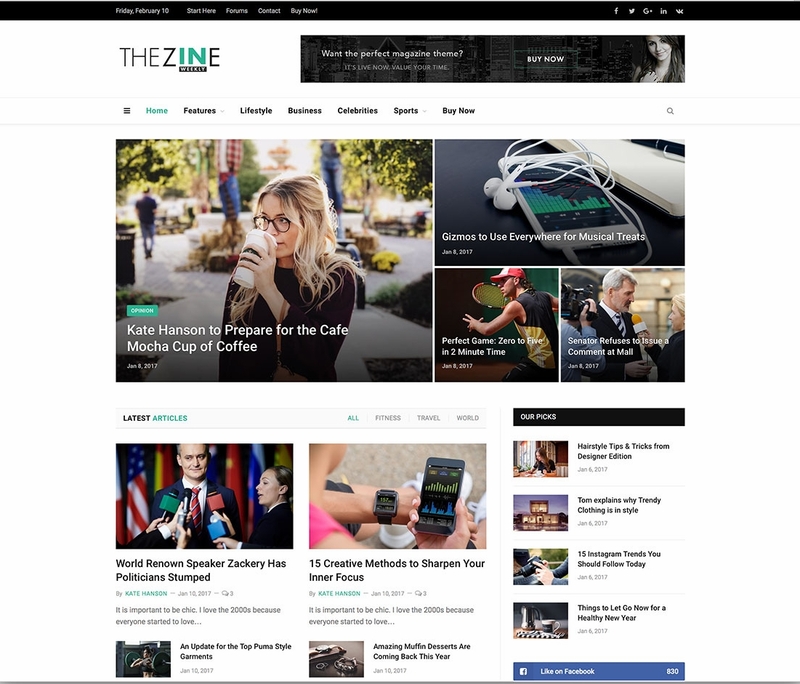 Domino is a modern and elegant, clean and pristine, legible and dynamic, well structured and very thoughtfully designed, user friendly and fast-loading, search engine optimized and intuitively customizable, flexible and functional responsive news and magazine theme. With potent features like the Dynamic Homepage Builder and the Visual Customizer, along with an advanced Theme Options Panel, Domino will quickly and effortlessly lend itself to suit your every visual and branding necessity. And with the Jetpack supercharge pack included, tons of sophisticated elements like Tiled Galleries, Related Posts and Extra Sidebar Widgets become instantly available for your utmost convenience. Carousel Widget, you can have your best or featured stories in any of the Homepage’s several widget areas.